Product #21021 | SKU SWC88BHS5-C BAND | 0.0 (no ratings yet) Thanks for your rating! 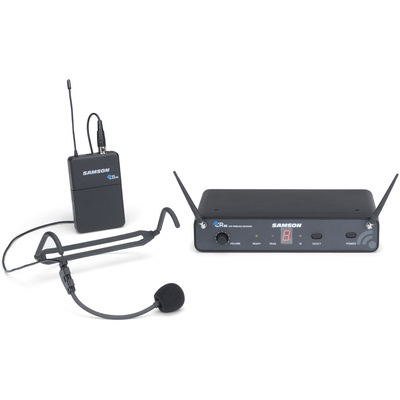 Samson’s Concert 88 UHF Headset Wireless System offers a high-performance UHF wireless solution where the freedom of mobility is a must. It’s perfect for singers, dancers, DJs, business professionals and others looking for stunning sound and versatility without cables. The frequency-agile Concert 88 Headset allows for up to 16 systems to operate simultaneously (region dependent) with up to 300’ separating the receiver and transmitter. At the core of the system is the CR88 Wireless Receiver. Featuring a true diversity design, the CR88 minimizes signal dropouts during performance. If a dropout does occur, the CR88’s tone key and auto mute functions eliminate any background noise until the signal is restored. With Samson’s Concert 88 Headset Wireless System, advanced technology and total versatility combine to provide high-quality wireless performance wherever singers, dancers, DJs, business professionals and others need it.